Even with no major new developments or numbers to report, the economy remained the top story in the news l ast week as the media settled into a kind of post-election holding pattern. From Nov. 15-21, the economy accounted for 11% of the newshole according to the Pew Research Center’s Project for Excellence in Journalism. That coverage included a handful of storylines, mostly policy-oriented, including the federal debt panel and the debate over Bush-era tax cuts. Stories about the labor and housing situation made the news as well. Although coverage is far below the peak levels in late 2008 and early 2009 when the prospect of a depression seemed real, the economy has proved to be a resilient and consistent story, never straying off the media radar screen. 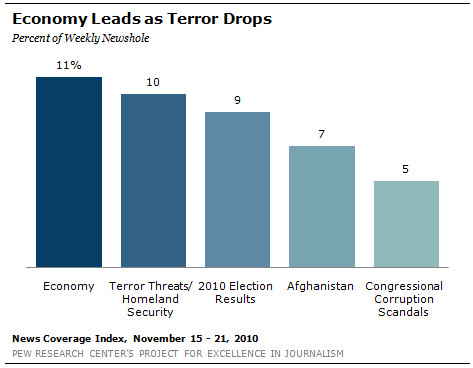 To date, it is the biggest story of 2010, at 12% of the newshole from January 1 through Nov. 21. And in the past 12 weeks, for example, it has registered as the No.1 or No. 2 story 11 times. At times this year, the economy has been overshadowed by a blockbuster news event, only to resurface after that event subsides. After a month in which the debate over health care legislation commanded the headlines, the economy returned to the top slot (8% from March 29-April 4) one week after the measure’s passage. The Gulf oil spill disaster dominated the news agenda for months over the summer, but by the week of August 2-8, when the leak was finally stopped, the economy that topped the news agenda, at12%. And while the 2010 elections dominated from Labor Day to Election Day (30% of the newshole), the economy re-emerged as the top story (15%), the week after the voting ended (Nov. 8-14). The No. 2 story last week, at 10% of the newshole, revolved around efforts by the U.S. to combat terrorism, chiefly a growing public outcry over intensified air safety efforts by the Transportation Safety Administration. Coverage of new frisking and x-ray procedures in airports, which many complained were too invasive, made up most of the coverage. The verdict in the case of the Ahmed Ghailani, first Guantanamo Bay detainee to be tried in a civilian court, generated attention as well. Coming next, at No. 3, was the continuing fallout from the midterm elections, focused in part on the jockeying for power within the Republican Party between the tea party forces and more establishment figures. These and other post-election stories made up another 9% of the week’s coverage. The conflict in Afghanistan registered as the No. 4 story last week (at 7%), with the bulk of the coverage devoted to a rare event—a Medal of Honor being bestowed upon a living U.S. soldier for the first time since the Vietnam War. The award ceremony was covered live by all three major cable news outlets. Finally, the congressional ethics hearings of New York Rep. Charlie Rangel made up another 5% of the week’s news. Rangel was convicted of 11 counts of wrongdoing, and in a display of pique, walked out of the hearing before it was through. On Nov. 19, he became the first House member in nearly 30 years to be recommended for censure. For the second week in a row, the economy topped the news, finishing as the top story in three media sectors—radio news (20%), newspapers (12%) and online (8%). The coverage included a mix of storylines, with the prominent ones focusing more on policy matters than the ups and downs of the marketplace. The federal deficit was one of these subjects, as analysts continued to debate the merits of the Obama-appointed national debt commission, a topic that received prominent media treatment the week prior. Some of the criticism of the commission, including complaints from members of Obama’s own party, persisted. On the November 15 broadcast of CNN’s Parker Spitzer, New York Rep. Anthony Weiner bemoaned what he perceived to be the failure of the Democrats to protect the middle class: “I think to some degree it’s the opposite of leadership to appoint these commissions and say ‘all right, I’ll see what they come up with,’” said Weiner. Another portion of the economic coverage dealt with the Bush-era tax cuts. Political talk show hosts in particular dominated that discussion of whether the Obama Administration should extend all or part of the cuts enacted in 2001 and 2003 (they expire at the end of December). The majority of that coverage focused on the rollout of new search procedures at many of the nation’s airports. One passenger named John Tyner became a populist symbol for those who object to full body pat-downs and x-ray screenings on privacy grounds when his video, documenting his own airport indignities, went viral. One site that picked it up, the Huffington Post, posted the entire exchange on its site on November 15, consisting of three videos totaling about 30 minutes in length. But a Washington Post story, posted online on Nov. 16, cited a CBS poll finding that 81% of those surveyed had no objections to the new screenings. In other terrorism-related news, last week marked the verdict in the trial of Ahmed Ghailani, the first Guantanamo Bay prisoner to be tried in civilian court. Ghailani was acquitted on all but one of more than 280 criminal charges, leading some to question whether terror suspects should be tried in those courts. The midterm elections, which were No. 3 overall for the week at 9%, were the No. 2 story in cable (14%) and newspapers (10%). Continued coverage of election results revealed some interesting power dynamics within the Republican Party. When GOP Senate Minority Leader Mitch McConnell of Kentucky—considered by some a consummate insider—surprised many by supporting a ban on earmarks, his change of heart was attributed by some as further evidence of the tea party’s clout within the GOP. Shepard Smith, anchor of the Fox News program “Fox Report,” described the ban on November 16 as “a priority of the tea party movement … but until yesterday was opposed by the GOP leader in the Senate, Mitch McConnell in a debate that analysts said threatened to split that Party.” The program went on to air footage of tea party favorite Rep. Michelle Bachmann praising McConnell for having heeded the tea party message. Another theme to the post-election coverage last week was the realignment of the House leadership teams, with current House Speaker Rep. Nancy Pelosi’s election to the minority leadership position and Minority Leader John Boehner’s election to become the new Speaker when the next Congress is sworn in. Much of the coverage of the conflict in Afghanistan, No. 4 at 7% of the newshole last week, offered some relief from the ongoing violence as the nation honored a veteran for his service. On Nov. 16, President Obama awarded the Medal of Honor to Staff Sgt. Salvatore Giunta, the first living service member from the Iraq and Afghanistan wars to receive it. The event was covered live by all three of the major cable networks. The medal was given in recognition of a day three years earlier when Giunta, ambushed and under fire in Afghanistan, chased down two Taliban soldiers carrying his wounded comrade away and rescued him. Finally, rounding out the top stories of the week, at 5% of the newshole, was the corruption trial of New York Democratic Rep. Charlie Rangel, who was found guilty of 11 ethics violations by a House subcommittee. Rangel’s flair for the dramatic in no small part kept him in the headlines. At one point, Rangel made a tearful plea for leniency. And when found guilty, he walked out of the committee hearing room, saying he had no money for a lawyer. To some extent, Barack Obama was out of the media’s glare last week. While still the top newsmaker from November 15-21, he appeared as a dominant factor in 6% of all stories, less than the 10% the week before when the president took a pounding in the press on a number of issues—from the debt commission to his troubled Asian summitry. 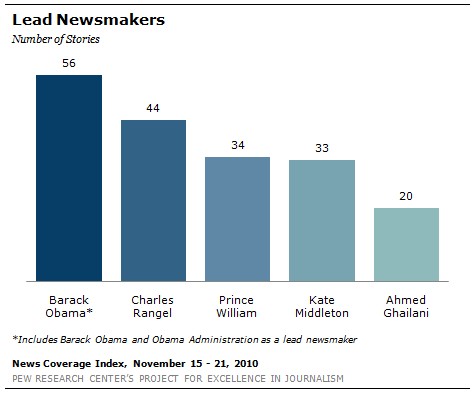 (To be considered a lead newsmaker, someone has to appear in at least 50% of the story.). In rebuttal to the notion that all press is good press, New York Rep. Charlie Rangel held the No. 2 newsmaker spot last week, featuring prominently in 5% of all stories. Rangel’s ethics violations and his emotional reaction to them provided plenty of attention by the media, not much of it very flattering. On a more positive note, the next two biggest newsmakers generated attention for an event many had been anticipating. British royal officials announced on Tuesday, Nov. 16, that Prince William (No. 3, at 4% of stories) became engaged to his longtime girlfriend Kate Middleton (No. 4, at 3%). Overall, the news of their upcoming royal wedding was the week’s seventh-biggest story, at 4% lf the newshole. Ahmed Ghailani was the No. 5 newsmaker last week, at 2% of all stories. Ghailani, a Guantanamo detainee, was the first one to be tried in federal courts. He was convicted of one count, conspiracy to blow up American embassies in Kenya and Tanzania in 1998.